Some of my favorite summer recipes are one-dish meals with summer vegetables like tomatoes and bell pepper. Whether I’m entertaining or cooking up a tasty dinner for just my family, this recipe for my Spanish Chicken & Seafood Paella always comes to mind. It’s simple to make and comes out even better when cooked in a traditional paella pan. 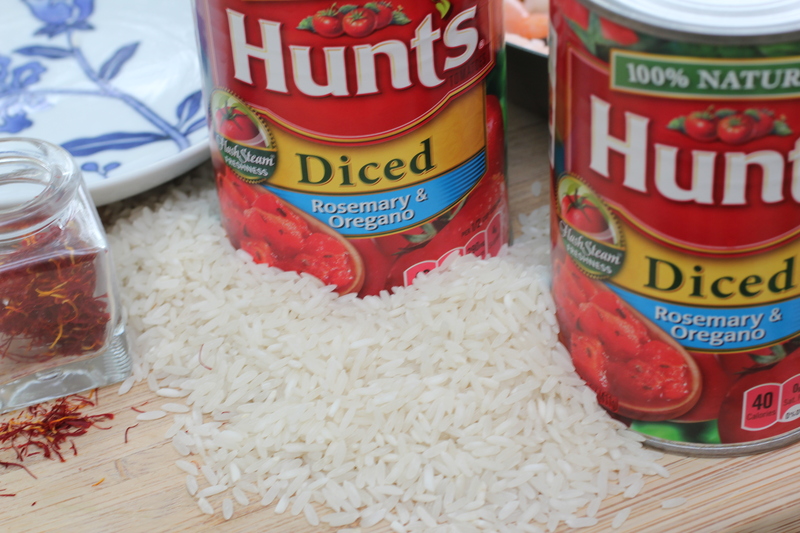 Hunt’s uses a unique flashsteam peeling method for their diced tomatoes, so I chose Hunt’s Diced Tomatoes with Rosemary & Oregano for an extra garden flavor in the tomato sauce section at Walmart. Heat a oil in large heated deep skillet or paella pan over medium-high heat. Add bell peppers and onions along with chorizo to sauté until peppers are tender. Add rice, diced tomatoes, tomato paste and saffron to sauté for another minute. Once boiling, lay chicken and shrimp on top then cover the pan (if you’re using a paella pan without a lid, you can use aluminum foil to cover), reduce heat to low. Simmer until rice has absorbed liquid, approximately 25 minutes. More great recipes with tomatoes and information can be found at hunts.com and readyseteat.com. You can also follow Hunt’s on Facebook by clicking here: Follow Hunt’s on Facebook or by following our campaign at #DinnerDone and #CollectiveBias. My morning coffee is a trusted travel companion throughout my morning journey. From sunrise meditations and getting dressed to packing lunches and getting kids ready for school, the journey is quick but can be full of unexpected challenges (okay, we’ll call them surprises). The best coffee maker combined with some flavored coffee helps me through these surprises and on to an even brighter day. This week, I’m helping one lucky winner with their morning journey by giving away my favorite drip coffee maker, Mr. Coffee® 1-cup Optimal Brew™ Coffee Maker along with two bags of flavored Millstone® coffee in Caramel Truffle and Chocolate Velvet flavors from Walmart. The contest runs through May 16th and one entry on Twitter is allowed per day. The winner will be mailed the Coffee Maker and coffee directly from me via US Mail. It’s easy to enter and only takes a minute! Mornings are a journey in my home and a sacred part of my day. Here’s an Instagram video of just one of my many #CoffeeJourneys, so be sure to share yours on Instagram with me! Is your coffee journey sometime other than during the morning? Do you have a special coffee journey you would like to share? Upload your #CoffeeJourney video to Instagram or leave a Comment below, or follow #CoffeeJourneys and #CollectiveBias on Twitter to share your coffee journey with me! My Mr. Coffee® 10-cup Thermal Coffee Maker was found in the Housewares department at Walmart. Millstone coffee found in Coffee section. Valentine’s Day is just around the corner and it’s tradition for me to “wine and dine” my sweet Valentines….. all five of them. Why make a romantic dinner for just two when I have my little ones to celebrate love with. Who has time to spend hours in the kitchen making a gourmet meal? With a little creative flair, this working mom needs a bit of help in the kitchen. A quick stop by Walmart on the way home got me all of the ingredients for a fun and romantic family dinner including a small bouquet of red roses. Creating a romantic family dinner can be both fun and simple. I start by setting the table with some elegant and fun Valentine’s decor. Personally, I don’t do paper products and don’t mind bringing out all of my fine serving dishes and candelabra. For dinner, I’ve prepared some pasta with broccoli and chicken but want some gourmet appetizers on the table. I picked up the Buitoni sauces in both Alfredo and Marinera for a “dipping” dinner idea. I prepared some meatballs, cheese sticks and vegetables for my sweet Valentine’s to dip in the warmed sauces. And now for the sweet part. Tonight was my first time making Tres Leches cake and I discovered two things. First, it’s not as hard as I thought it was going to be thanks to Nestle Tres Leches Cake Kit. And second, my family thought it was one of the most delicious desserts I’ve ever made. It does need a little time in the refrigerator for the cake to soak up the sweet milk, so I suggest making the cake the day before. Maintaining a balanced lifestyle is something I struggle with constantly as with most busy moms I know. When work and deadlines collide with school projects and dance lessons, it’s not always easy to make the best choices when it comes to eating. And when the holidays arrive it creates the perform storm making it nearly impossible to keep up those healthy habits I worked so hard to maintain throughout the year. This is why I decide to forgive myself each holiday season by allowing a few weeks of no exercise, Christmas cookies, eggnog and other indulges that we all don’t really need to know about. Now it’s time to say hello to 2014 and get back on track for the new year. To get back on track, I begin with choices. When I’m working away at my desk on a project, I don’t have the time to stop and make myself lunch which leads to more hunger, which eventually leads to me grabbing something quick that isn’t the best choice for sustaining myself throughout the day. In fact, that bag of chips typically leads to more hunger about an hour later. Therefor, making better food choices is at the top of my list to getting back on track. When you’re a busy working mom, it’s easier to make better food choices when they’re convenient. During a trip to Walmart today, I made a few purchases which allow me to have snacks and meals ready when hunger strikes. I’m munching away as we speak on these LEAN CUISINE® Stuffed Pretzels which are stuffed with Three Cheese & Spinach. Switching up my regular coffee sweetener with CoffeeMate Better For You Sugar-Free Vanilla is also another choice for getting my new year back on track.